We've built a labyrinth here on the banks of the Clackamas River. Visit it at A Clackamas Labyrinth. Our blog features the lowdown on area outdoor activities, from gardening, nature observations to hikes to posts about local parks both new or just newsworthy. We will be adding noteworthy items about restoration projects affecting the river and other issues. Some interesting projects are in the pipeline - and you can find about them in our blog! More than just a hike! Leader Bryon Boyce will provide a running commentary on wildflowers, geology, and other natural history points of interest. The Natural City Tour will meet at 9 AM at the offices of the Clackamas River Basin Council. The later three tours will meet at the Estacada Ranger Station to accommodate those living farther out. 9 AM for all. Our urban area is blessed with a variety of natural areas which feature remnants of the diverse "valley floor" habitats. Many of these areas are little visited even by those active in preservation work. This tour visits three outstanding examples in two locations. In the morning see the newly linked Camassia Natural Area (The Nature Conservancy's first purchase in Oregon) and West Linn Wilderness Park, home of the largest and oldest firs in the urban area. The dwarf oak savannas of Camassia are unique, and the quaking aspen pond is unusual locally. This tour is timed to catch what is probably the best flower display in the Portland urban area. The effects of the Missoula Floods are especially obvious here. Hopefully the osprey nest will be occupied. In early afternoon we will visit Mount Talbert, the first Metro acquisition to be developed and opened to the public. The 750 foot extinct volcano has high quality natural vegetation little affected by invasives. The remnant wet oak savannas are receiving preferential management, including fir, cottonwood and brush removal. This woodland type was once common in the urban area. Some uncommon plants are present. The area is large enough to host deer, coyote, owls and in winter pileated woodpeckers. Meet at the Clackamas River Basin Council offices (19750 SE Damascus Lane, just off Foster Road in Damascus.) at 9 AM. Bring lunch, water and hiking shoes or boots. Dress considering the weather. Expect generally good trails with a little rock hopping. There will be two to three hours on the trails, depending on discussion and picture taking. This outing into the lushly forested Western Cascades includes open wildflower areas and a sampling of features that illustrate the ancient volcanic history of the region. After driving up the Molalla River past the interesting Molalla Eye, the hiking trail weaves between the Molalla and Clackamas drainages, and between Forest Service and BLM land. The unsigned route was long abandoned but has been reopened during the past few years. At Right Angle Viewpoint on the Clackamas side, drought-prone unstable soil on an ancient pyroclastic flow prevents tree growth, and provides the 180 degree viewpoint. Spires formed by volcanic action in the volcanic flow still stand (an origin similar to that of the Pinnacles at Crater Lake). To the north is Old Whitespot (on the maps as Baty Butte) and Mount Hood, to the east Thunder and Fish Creek Mountains, and southeast Olallie Butte and south Mount Jefferson. The white spot of Old Whitespot is an ancient creekbed filled white pumice, and now dissected, leaving a U-shaped display in a large little-vegetated area. We will also visit an overlook above a glacial valley and onto the lower slopes just below the white spot. Easy to moderate 3-4 miles hike with a cumulative elevation gain of 5-600 ft. Trailhead is about 4500 ft and the highpoint is 4900 at Right Angle Viewpoint. Milage and gaom are approximate as the route is not on maps that show trail milage or elevations. Expect wildflowers and views on this 6.4 mile long round trip. Natural rockgardens and meadows are seen as we pass over to the shoulders of Dickey and South Dickey Peak to Bull of the Woods Lookout at 5523 ft. This is the westernmost ridge which features plants more common to the east. The lookout was built in 1942 and is the only surviving one from the WWII era in the Mount Hood National Forest. It was formerly available for rent from the Forest Service, but is currently undergoing restoration. Mules have been put to use for this project, one of the first uses of either horses or mules in decades in the area. An 825 ft. elevation gain along this ridge just east of Pansy Basin. A easy to moderate hike at 250 ft. gain per mile. Visit the under-appreciated highlands of Olallie Scenic Area. Most of the area underwent sheet glaciation rather than valley glaciation, resulting in flatter terrain and so many lakes and ponds that many have never been named. This 5 mile partial loop hike will pass well over a dozen water bodies. Other features include wide-ranging views with the glaciers of Mount Jefferson only 9 miles distant, glacial striations in bedrock, wildflowers, and a mixed woodland vegetation with subalpine variations. This is a easy to moderate hike with a 900 ft. elevation gain, most of which will be on the way up Double Peak to the high point of 5900 ft. The route meanders between the Clackamas, Santiam and Deschutes watersheds. Posted under Nature Observations, Bird Watching, and Nature in the City. Posted under Nature Observations, Hiking, and Nature in the City. Posted under Geology and Nature Observations. This website will eventually contain commentary from our blog with several blog entries placed together in a new combined format, more article-like. As articles are added they will rotate through over time. Check our blog for an idea of the future of this website! Entries will range from birdwatching, mountain hiking and cross country skiing, garden journals, and observations of nature and related subjects. Wondering where the Clackamas River is? Here is a link to a Google hybrid map of the Clackamas River area, with Mount Hood the large white object to the right of center, and all of the river's watershed covered. Our actual location is under the '213' of Highway 213 on the initial map. 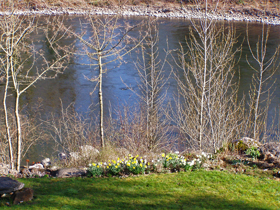 This picture was taken March 9th 2005, and shows part of our Clackamas River Outlook. This page last updated on Tuesday, May 20, 2008.
are copywrited © 2005-8 by Bryon D. Boyce. All rights reserved.